A familiar pamphlet was pushed through the letterbox – Adult Education Night Classes. I dropped the hoover to look through the list. Over the years (pre and post babies) I’ve loved doing night classes in all sorts of things like computers, yoga, tennis, photography, printmaking and creative writing. Never made it to Taekwon–Do, Ballroom or Line Dancing but you never know, if Garth Brooks lands a gig here, might give that a go. I was a night class junkie, addicted to my fix of self improvement and shamelessly happy to escape from the kids. However, after years of attending classes, I’m now on the other side of the desk at enrolment night. 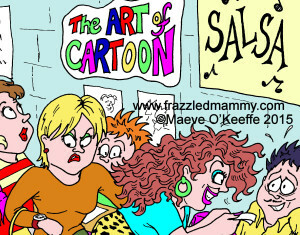 Back in 2004 I began as a tutor enticing brave souls to sign up for my Art of Cartoon course. It was a new experience for me. At that Community College’s open night, I first had to attend a meeting with the other tutors where we were briefed on the protocol of signing up students, taking the money, issuing receipts etc. We were then led down the corridor into the main hall. For a moment it felt like I could be walking through the tunnel into a packed Croke Park, for the hall was absolutely jointed – people everywhere! With portfolio, pens and other paraphernalia under my arm I jostled through the throng looking for my designated desk. After a while when things settled down and I’d fortunately signed up some students, it was interesting to see which courses still had a line of applicants. The keep-fit, computer and music modules were busy, especially the Guitar man, but if there was a prize for who had the biggest queue, it had to be the Salsa guy. Not only that, every person in that line was female – not a single fellah to be seen! Maybe the fact that he was friendly, fit and gorgeous had something to do with the popular uptake. And what better way to beat the dreary winter nights than stepping out to lively Latino rhythms? Whether it’s for fun, developing a talent or further study to enhance career, adult education is a great way of exploring new interests. Regardless of age, you invariably meet people and possibly make friends. Our openness to learning must be part of our homo sapiens survival kit. Personally, learning new things is my psychological pension plan to deter the brain from going to mush. It’s important to have interests of our own. When the kids will eventually leave home (will I ever see the day? ), I don’t want to be left twiddling my thumbs with nothing to do! And so, to any cartoon fans who find my name on the Douglas night class pamphlet, this term’s Cartoon & Caricature Drawing course might be the one for you! 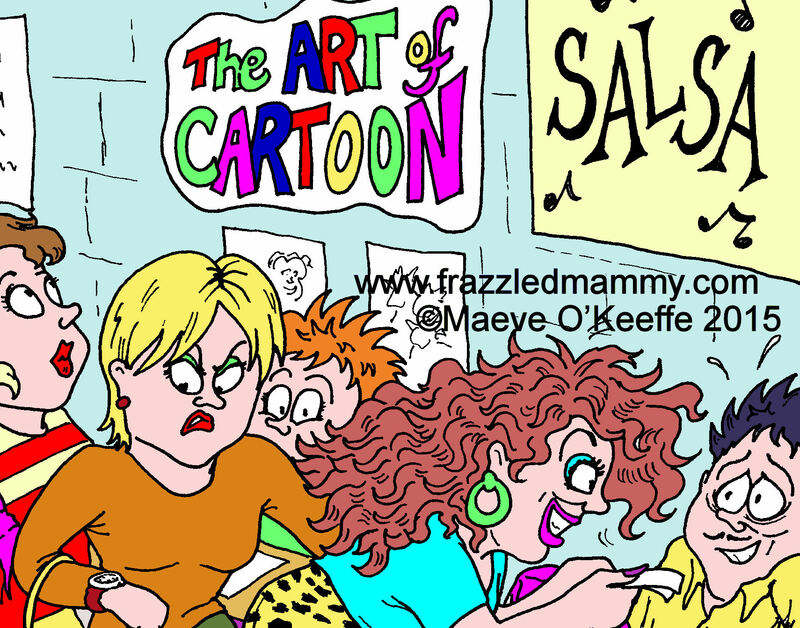 This entry was posted in Parenthood and tagged Cartoon illustrator, Cork, Ireland, Maeve O'Keeffe on January 20, 2015 by frazzledmammy.